If you take a look at the bare chassis of the Mercedes SL 400 you will see a significant expression of lightweight automotive technology. 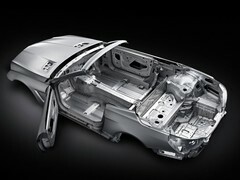 The car is built of aluminium made up from a multitud of sheets, extrusions and castings. The front firewall is one large cast element. One of the largest pieces of cast aluminium produced within the industry. The majority of the suspension components are also aluminium castings.